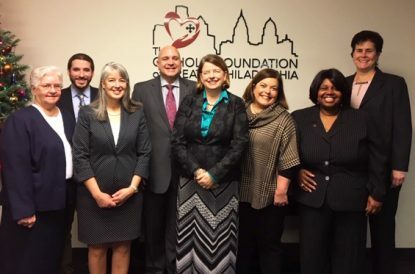 Some of the recipients of a grants from the Catholic Foundation of Greater Philadelphia gather at the foundation’s office to show their gratitude for a total of $75,215 raised to enhance security at nine local Catholic schools. Given the number of high-profile acts of violence committed against children in schools in recent years, school safety is of highest priority. Schools, no matter how safe their community is, have been proactive in taking measures to prevent anything happening on their campus. At times they wish they could do more, but funding, especially in the nonpublic school sector, is not always there. Recently the Catholic Foundation of Greater Philadelphia stepped into the breech by awarding a total of $75,215 in grants to nine Catholic schools within the archdiocese to assist them in making their facilities and schools as safe as possible. Just what those needs are varied from school to school. At 880-student Roman Catholic High School in downtown Philadelphia, a grant of $10,000 was used to improve the locks and passkey systems at three buildings. The school has not experienced any incident but rather is being proactive and prepared, he explained. Roman Catholic already has an elaborate system of cameras to monitor its entire center city Philadelphia campus, including outdoors. Also, recently Pearl Street, a small street that bisects the campus, was closed off with gates with permission from the city. Something that will make the area even safer, Father Bongard notes, the Philadelphia Police Department is in the process of relocating its headquarters to the former Inquirer building just on the other side of Broad Street. Our Mother of Providence Regional School in Wallingford, which has 249 students, also received a $10,000 grant for security cameras and an access control system. At 350-student Holy Family Regional Catholic School in Levittown, a $10,000 grant went toward steel door replacement with automatic closure doors. In addition to child safety another concern for schools is theft and vandalism. The blackboards and hand-me-down text books of the past have largely been replaced by expensive computers and other sophisticated equipment. A couple of years ago Holy Family did have a break-in and a number of iPads were stolen. Thanks to the security cameras in place, most of them were recovered by the police, Robinson said. Nativity of Our Lord School in Warminster, which has 475 students, received $10,000 to upgrade security locks and cameras around the school. “These things are costly,” said Roselee Maddaloni, Nativity’s principal. — St. Teresa of Calcutta, Limerick — $5,000 for a security control system.